Space.NK is a British chain of cosmetic-and-fragrance shops, and despite having been to the UK three times in the last three years, I've never been into one. Not for lack of trying, I suppose, but imagine what a trial it must be to travel with me if (as Jim is) you're averse to pretty much everything scented: me trying to find a reason to duck into every perfumery and department-store fragrance section I happen to notice, he trying to do exactly the opposite. (He doesn't begrudge me the visits: it's just that he usually ends up killing time browsing for things he doesn't need, or worse, standing on the street outside the shop--there aren't a lot of malls in the UK, so it isn't as if he can just go to another nearby store in the same building.) If you asked him, he'd probably tell you that I didn't lack for scent shopping in the UK, but I could name dozens of places I didn't go to: we were on Carnaby Street and I could see Liberty but had to give it a pass, for god's sake! 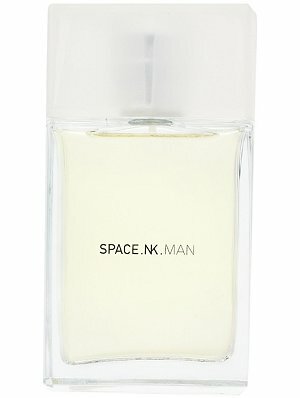 Anyway, I've never been to a Space.NK store, but as it happens I do have a sample of their first men's scent, which is named, logically enough, Space.NK.Man. And the first time I put it on, I thought, "Oh, huh. Rocabar." At first sniff, it does resemble Rocabar (which was launched in 1998, three years earlier): they are both woody, spicy outdoor scents with tons of conifer needles, both appealingly masculine. But the more you wear Space.NK.Man, the more you realize that the two scents are essentially the same idea treated in very, very different ways. Rocabar puts all its dry, coniferous notes up front, really wallops you with them, and only later treats you to an unexpected bath of vanilla, while Space.NK.Man starts off similarly dry and austere but then introduces its warm, creamy notes much earlier--they're not a surprise finish, but a part of the tapestry of the scent. I already have a a bottle of Rocabar that will last me pretty much forever, but perhaps Jim is right to try to keep me out of a Space.NK, because if I found myself in one, I'm not entirely sure I could stop myself from buying Space.NK.Man. It's that gorgeous.